Tangiers Hostel is a small, social and sincere home of international travellers who believe hostels are much more than a cheap place to stay. For us, it's about meeting fascinating people from all over the world, making lasting friendships, and creating community, this place is more than a hostel to us; it is our home. As we are in the business of getting to know people, we strive to learn about the interesting people who choose to book with us. Our staffs are very friendly, polite, welcoming and knowledgeable, they speak: English, French, Spanish, Danish, Arabic, a bit of Italian and German. They'll make sure that you'll have a pleasant memorable experience in tangier.If you think this unique hostel is right up your alley, we invite you to come spend some time with us to discover and experience Tangier and Morocco from a whole new different perspective. 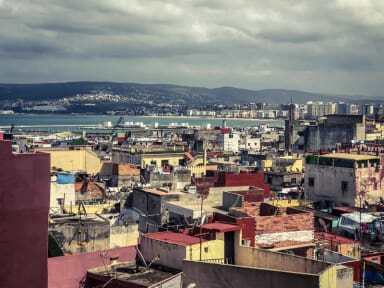 Tangier and the Medina is chock full of things to do, of course. And, since we do a bit of traveling ourselves, we know budget is the key. We definitely will not push a bunch of expensive tours and tickets on you as other hostels around do. We are just happy to point you in the direction you seek- armed with a map or an offline navigation app and personal recommendations.We are located in the historic Kasbah of Tangiers old Medina surrounded by the main attractions and historical sites and the beautiful streets of the old Medina of Tangier including: Kasbah of Tangier, Kasbah Museum, Bab El-Assa, Café Baba, Café Hafa, Ibn Battuta’s tomb, Old Medina, Grand Socco and Petit Socco, Garra D'Kasbah/Place Du Mechoir, Mendoubia gardens, Parc Perdicaris/ Rmilate, Cap Spartel, Hercules Caves. And many other amazing and fun things to do in this fascinating city. 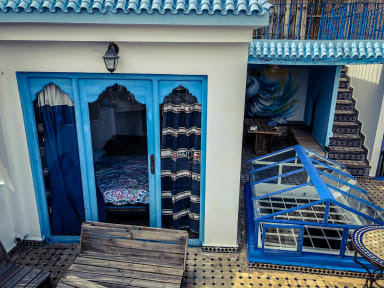 Tangiers Hostel offers mixed dorms & private rooms, lockers, clean bathrooms/ showers, a common Moroccan salon and a fully stocked kitchen/ BBQ spot on the terrace. We cook some yummy food and routinely invite our guests to join us. Also we offer Free Breakfast, Wi-Fi, a Book Exchange, and a double terrace overlooking the Kasbah, fishing port, old Medina, ‘Ville nouvelle’ and the Mediterranean. As a backpackers Hostel, Tangiers Hostel welcome those coming to tangier from all over the world. Permanenza di due notti durante un viaggio itinerante molto soddisfacente. Abbiamo preso la camera matrimoniale con il bagno privato che si trova sulla terrazza: stupendo, si poteva vedere l'alba dal letto! Struttura pulita e persone disponibili, atmosfera godibilissima e situato nel cuore della Medina di Tangeri. Essendo gennaio di notte la temperatura scendeva parecchio... c'erano molte coperte pesantissime e non abbiamo avuto freddo, ma avremmo gradito una stufetta :) Consigliatissimo!